Physics Professor Rajarshi Roy and Mathematics Professor Brian Hunt at the University of Buea in Cameroon with doctoral students to oversee experiments. Looking to add international experience to your resume, or to extend your work into new countries or areas? A variety of opportunities are available for you, both on- and off- campus. 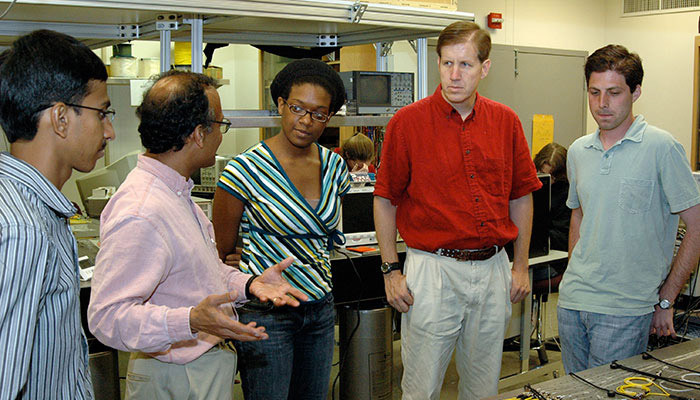 Apply for a UMD global partnership travel grant—faculty/researchers and staff. Apply for a Fulbright award. Start a study abroad program. Create a Global Classroom course. Submit a Joint Research Workshop proposal with colleagues at select universities around the world, to strengthen existing collaborations or develop new ones. Explore other international grant opportunities. Sharpen your existing language skills. The Language House Coffee Conversations provide you with a chance to practice, improve, or maintain your language skills in an informal, relaxed setting. Share your international experience with the campus and beyond. Participate in international activities on campus.